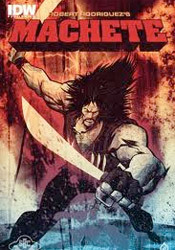 As the introductory chapter to a full ongoing series, coming your way this December, Machete #0 opens the door to a crazed adventure on par with the character’s crimson-drenched feature film debut. With both tales taking their hints from a paper-thin joke of a trailer in 2007’s Grindhouse, there’s plenty of room for elaboration here – but also no shortage of opportunity for gratuitous, mindless, mesmerizing violence. A rarity in the landscape of movie tie-ins, director Robert Rodriguez himself has taken on the comic’s writing duties (with an assist from Aaron Kaufman), which in theory should ensure an unusually close relationship between the two properties. Sadly, though, the comic just isn’t as much fun as the initial trailer or the eventual feature film. The action is just as careless, the plot just as transparent, but somewhere along the way we lost track of the charm and machismo that fueled Machete’s celluloid romp. Bold visuals and wild creativity can gloss over a lot in the theater, but with both elements removed in this print version, the plot’s shortcomings are stripped bare. There’s a fine line between playful parody and just plain bad storytelling, and Machete #0 takes several big steps in the wrong direction. Stuart Sayger’s rough, grizzled artwork flirts with both relevance and rebellion on every page. In some panels, Sayger’s thick ink splatters and quick, imprecise renderings provide a perfect counterpart for the story’s reckless, misdirected aggression. In others, it feels like the only guy in the room who doesn’t get the joke. On a few occasions, Jay Fotos’s brazen, invasive colors bail out a particularly bad page, but just as many others are irreparably spoiled by a bland color choice or strange composition. It’s the very definition of hit-or-miss, but at least Sayger’s renditions of Danny Trejo’s unmistakably grizzled mug are easily identifiable. The comic adaptation of this year’s most stylishly awful movie theater action hit is a perfect match in some regards and a total miss in others. It’s got the large supply of gunfire, knife fights and ladies that helped to power the film, but when push comes to shove it’s nowhere near as wild a ride. The lines of dialog that would’ve had me cracking up in the theater just came off as hackneyed and stupid in print, which had to be concern number one going into this project. It’s not there yet. Give it a skip.